THE FIRST CHRISTMAS - In the living rooms of a recently divorced couple we hear two versions of how their “first Christmas” apart from each other will be, why the divorce took place, and how a Christmas tree is really supposed to be decorated. 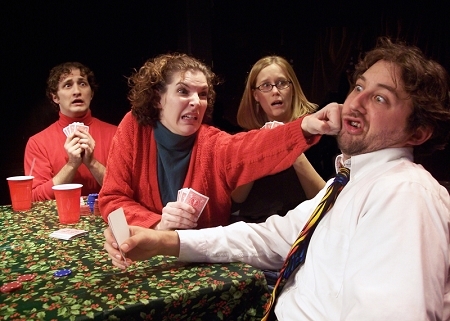 THREE KINGS - Two couples get together on Christmas Eve for a friendly game of poker. But, things get out of hand when a player runs out of money and starts betting the Christmas presents. 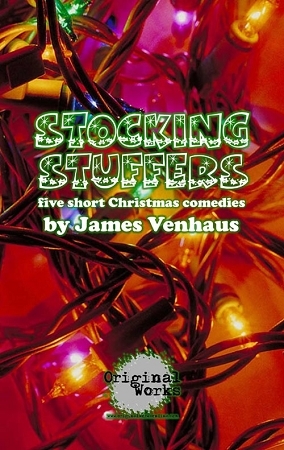 SANTA'S LITTLE HELPER - In the storeroom of an office during the annual Christmas party, a man and a woman come to discover more about each other and themselves than they bargained for. KRINGLE-PHOBIA - A man must confront his fear of Santa Claus as demonic manifestations of his fears tease, taunt and haunt him as he tries to work up the nerve to take his son to the mall to see Kris Kringle. HAPPY HOLIDAYS FROM ANDERSON, DAVIS, SETON, AND FENNER - Julia, a receptionist at a law firm is trying to get through the last ten minutes of her shift before the holidays. She gets calls from rude clients, her boss, her boyfriend, her mother and her best friend. Can she get them all sorted out before leaving for her second job as an elf at Macy’s? "a modest, heartfelt evening that brings some much needed joy to the world."